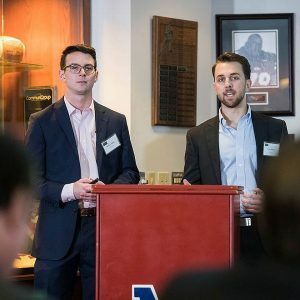 Junior accounting major Sam Harres and junior engineering major Will Tribble are the 2018 winners of the annual Gillespie Business Plan Competition. The event is hosted by the Ole Miss business school and encourages and rewards students who create plans for their own businesses. Harres is a member of Beta Alpha Psi, Phi Kappa Phi, Delta Psi fraternity and the Sally McDonnell Barksdale Honors College and is a former sports writer and editor for The Daily Mississippian. Tribble is a member of the Omicron Delta Kappa honor society, the Ole Miss Cycling Club, Delta Psi fraternity, Sally McDonnell Barksdale Honors College and is an editor for the UM Undergraduate Research Journal. Organized by the UM School of Business Administration, the competition has been held every year since 2005 and is open to any undergraduate or graduate student enrolled at Ole Miss. Harres and Tribble won first place in the competition for their company called Shortwork. The pair will receive $10,000 and rent-free office space for a year at the university’s Insight Park Innovation Hub. Bella Gonzalez was awarded second place for her business, LaLa Letter. Liz Lanford and Lindy Goodson were awarded third place for their business, Fraze Shades. Their winning business plan is for their self-described “micro-tutoring app” called Shortwork.co, which is an online marketplace for high school students to post homework problems and receive instructional videos from college students explaining how to solve them. The idea came from a problem both Harres and Tribble have encountered. Their goal is essentially to offer everyone access to an “older brother” via their website. For new users, the first two problems will be solved free of charge. From then on, each transaction costs $3, $2 of which will go to the solver. The pair worked to refine and perfect their presentation for well over a month. Competition submissions were due on March 4 and the final pitches were delivered on April 20 and followed by the awards ceremony. “We both put in at least 20 hours a week consistently, from working on the code for the app to working on our pitches and slide decks,” Tribble said. They already have big plans for developing the business further. Both Harres and Tribble have a year of school left so they will be able to take advantage of their remaining time in Oxford with the money they won. “We hope to finalize pilot programs in Jackson and Oxford over the summer in preparation for a hard product launch later this fall,” Harres said. Beyond that, they plan to use their winnings to partially fund the development of an iOS app. The Shortwork.co website went live last month but is still in the “proof of concept” phase. Both men said they’re excited to see where their work leads them. “If nothing else, the process of taking something from a hypothetical conversation to a business winning competitions and accepting customers has been beyond rewarding, and a fantastic learning experience,” Tribble said.